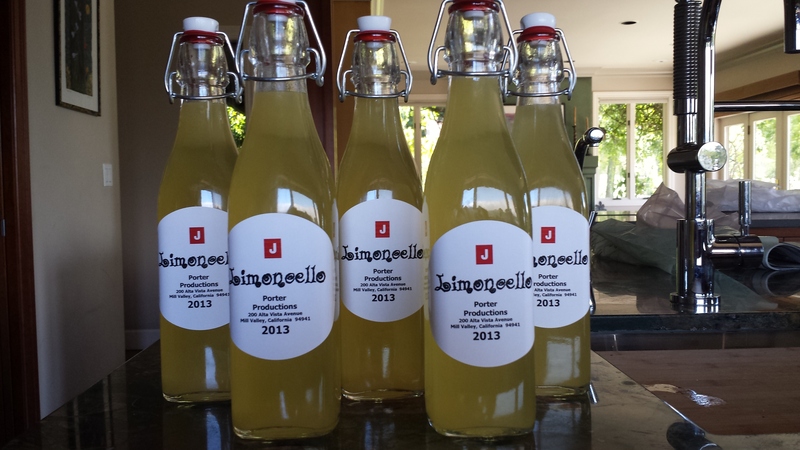 …Or you can combine the two and make Limoncello! I am lucky to have a beautiful, and bountiful, Meyer Lemon tree right outside my kitchen door. Most citrus trees bear two crops a year, a smaller one in the summer and the heaviest crop in winter. 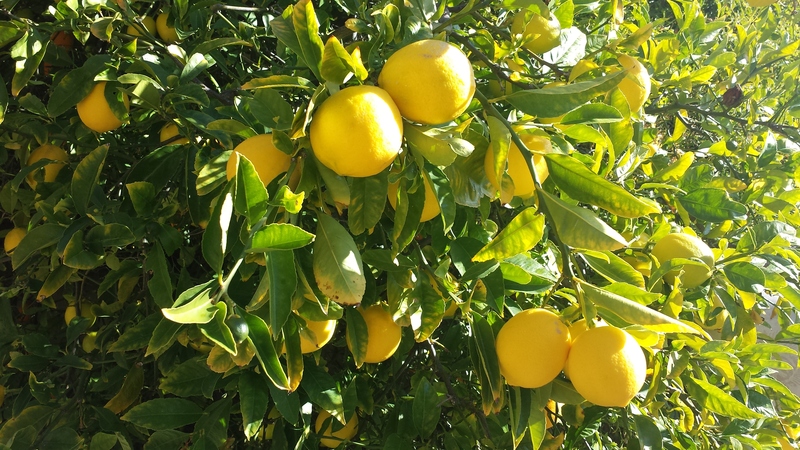 Meyer lemon trees, however, are known for bearing fruit all year long, although their largest crop is now. With such an abundance of fruit, I am always looking for ways to use lots of lemons at once. I don’t mind sharing but I hate when they are wasted. Limoncello is an easy way to use extra lemons, although is not instantly gratifying since there is a considerable wait time until you have a final product. 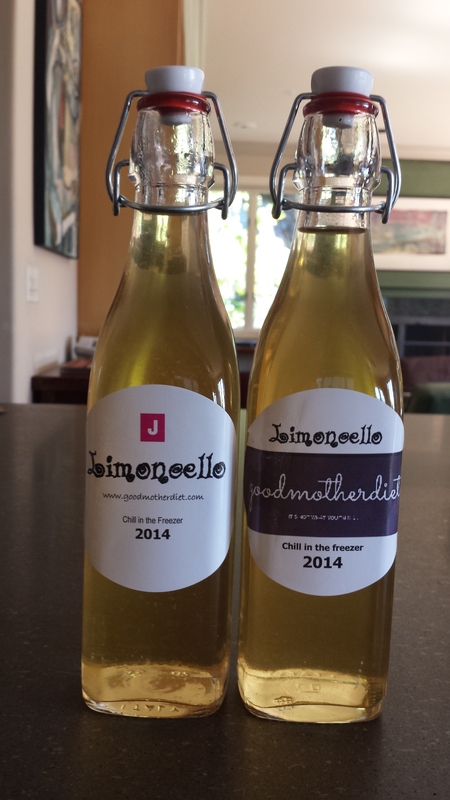 Limoncello is a crowd pleaser and makes a great gift, so our problem is that it goes too quickly. For that reason, as soon as I bottle one batch, I often start another. Even if you don’t have a tree in your backyard, its easy to find Meyer lemons this time of year at your supermarket or even at Costco. You can also use regular lemons with good results, so use what you have. It’s not too late! 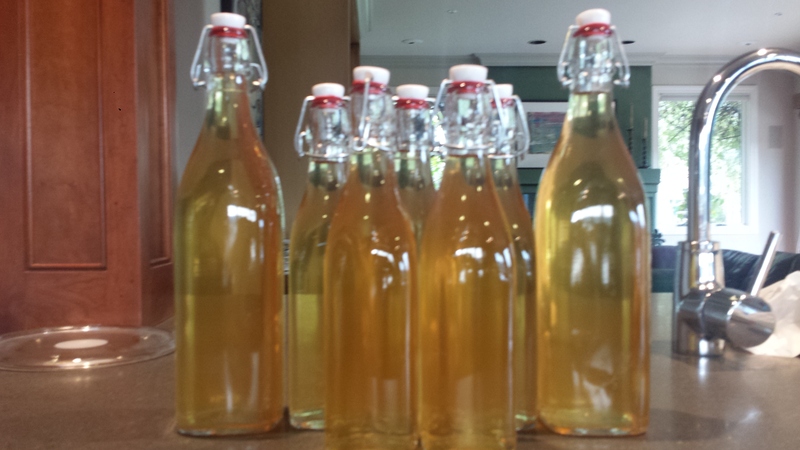 The Limoncello I have made in the past is more “California style”, rather than Italian. I found the recipe on the internet from someone in Berkeley who has a prolific meyer lemon tree in her backyard and came up with a recipe in an attempt to use up her lemons. Sounded familiar so I gave it a whirl. I can’t credit her for the recipe since I could never find her post again. I liked the fact that she uses whole lemons and not just the peel. The results were good and I’ve had no complaints, however, after our trip to Italy last summer, I decided to attempt the Italian version, which uses only the peel. Purists believe that this makes the best quality limoncello, so I decided to put it to the test. Here are a couple of photos from the ‘California style’ batch. In selecting the lemons, try to get organic since the peel is where most of the insecticides reside and often they are waxed to give them a longer shelf life. If you can’t find organic lemons, just scrub them with warm soapy water and dry them with a towel. I have divided the process into two steps. Since the limoncello needs to sit for 6 to 8 weeks before bottling, you don’t have to have everything on hand just to get started. The large Bell containers are easy to find at hardware or department stores like Target. The Container Store and Pier One Imports both carry a nice selection of flip cap bottles that are perfect for bottling. Lastly, think about ‘your’ label which is the finishing touch and gives it personality and helps to make it the perfect gift. http://www.onlinelabels.com has pretty much every size and shape label you could ever want and they have a downloadable template which makes it very easy. • Wash and dry lemons. If not using organic scrub them with a vegetable brush in warm soapy water. Drying helps remove any remaining residue. 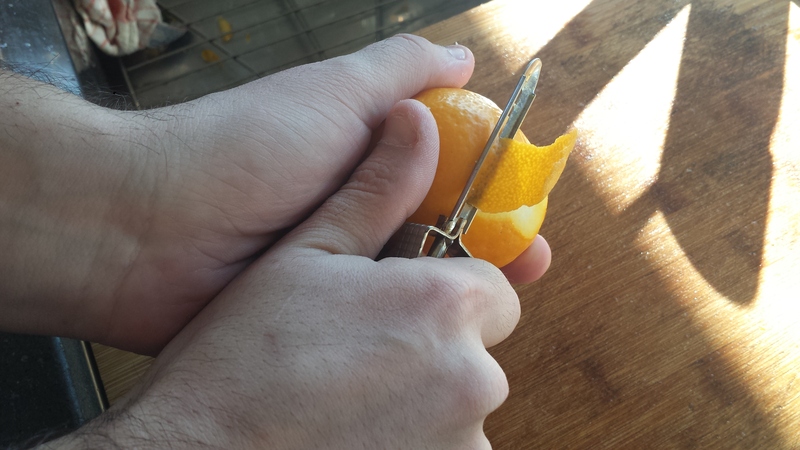 Using a potato peeler or a microplaner, carefully remove the peel trying not to get any of the bitter white pith. I used a potato peeler to cut long strips and then scraped any white from the back with a sharp knife. Squeeze the juice from the lemons. Add sugar and water to make lemonade or freeze in ice cube trays, then put in baggies when frozen and save for another use. • Let sit covered with a kitchen towel or two for 6 to 8 weeks. I like to give it a little shake every few days for the first couple of weeks, just to make sure it’s evenly mixed. After that you can store it somewhere dark and out of the way. 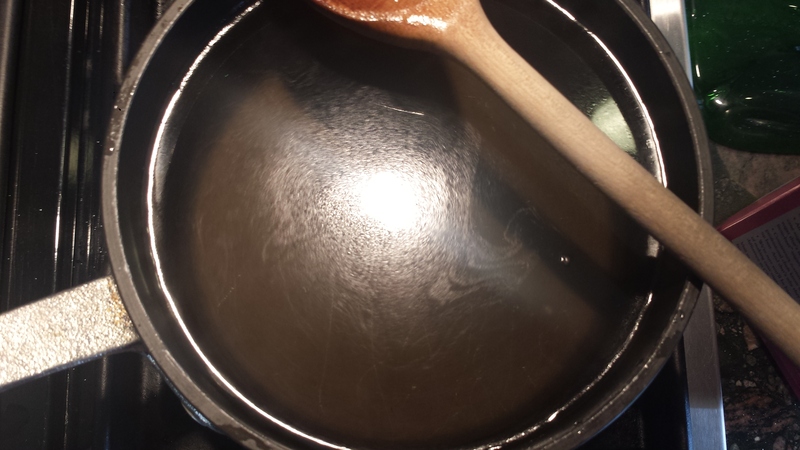 Heat water and sugar in a pot until the sugar dissolves and the simple syrup is clear. /Remove from heat and let cool to room temperature. 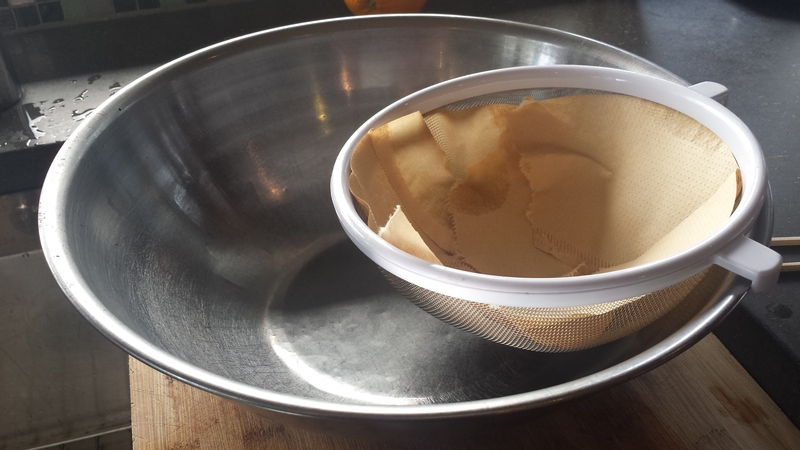 Line your mesh strainer with coffee filters and place it over the large bowl (or have someone hold it for you). 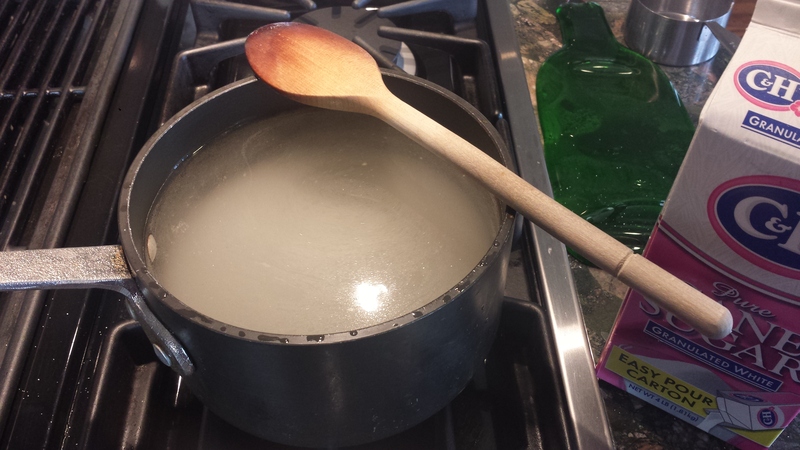 Carefully pour lemon/vodka mixture over the strainer, taking care not to let the liquid go over the top of the filters. 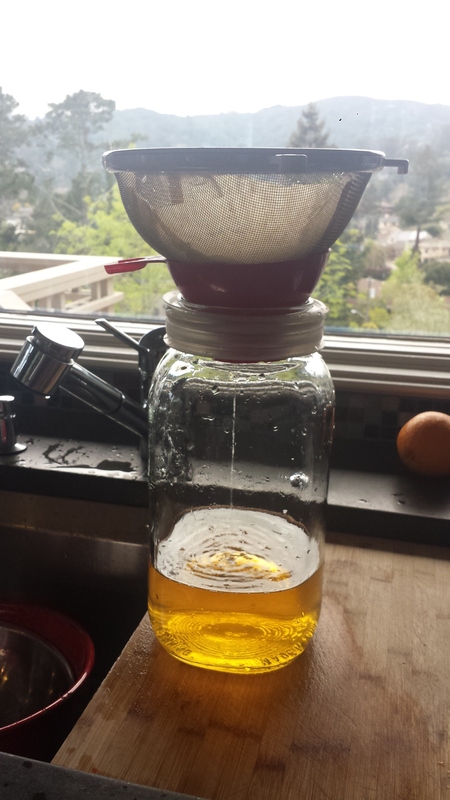 Clean Bell jar and pour filtered vodka mixture back into the jar (I would filter at least twice). Pour simple syrup into the jar and mix to combine. 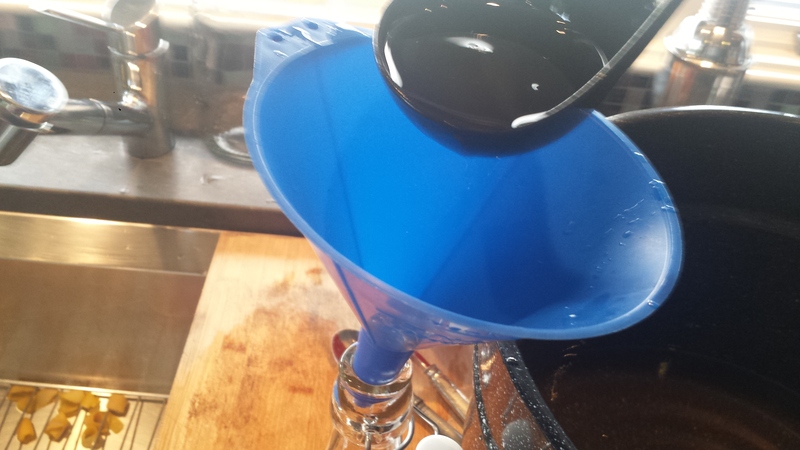 Place a funnel into one of the bottles (with a coffee filter if you want to filter again) and carefully ladle limoncello into the bottle leaving 1 inch clearance at the top. Seal the cap and repeat with remaining bottles. 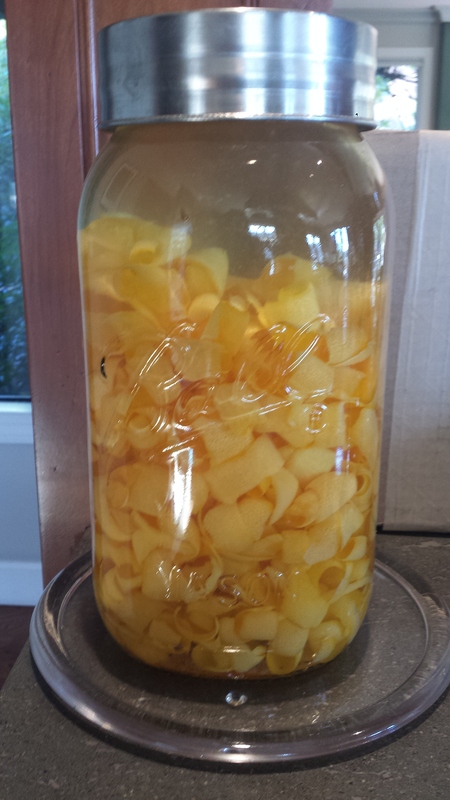 The Limoncello will continue to mellow and improve over the next several weeks. Label the bottles if desired. I’m testing a new label. What do you think? Store in a cool place. Serve icy cold from the freezer. So what was the final verdict? The Italian style version requires more preparation time, in the peeling of so many lemons, but the final product is smoother and tastes more like the Limoncello we had in Italy, although less sweet since we also reduced the amount of sugar. I think its worth the extra effort. Cheers! 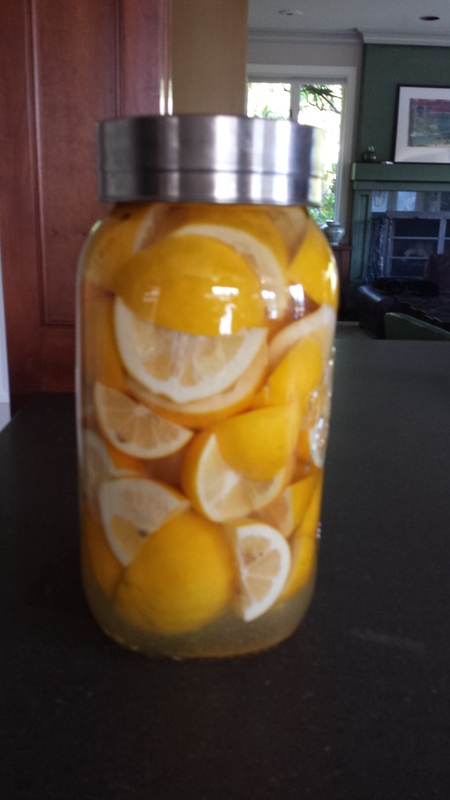 This entry was posted in All Recipes, Appetizers, Canning and Preserving/Gifts, Desserts, Vegan, vegetarian and tagged Limoncello, making limoncello, Meyer Lemons. Bookmark the permalink. Would love to see you. Come on up! Wow! It looks like you’re quite the baker. Thanks for following! 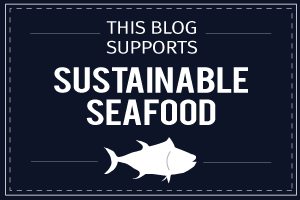 Thanks for mentioning us in your blog post! You’ve inspired me to limoncello 🙂 If you ever need anything please don’t hesitate to give us a call. 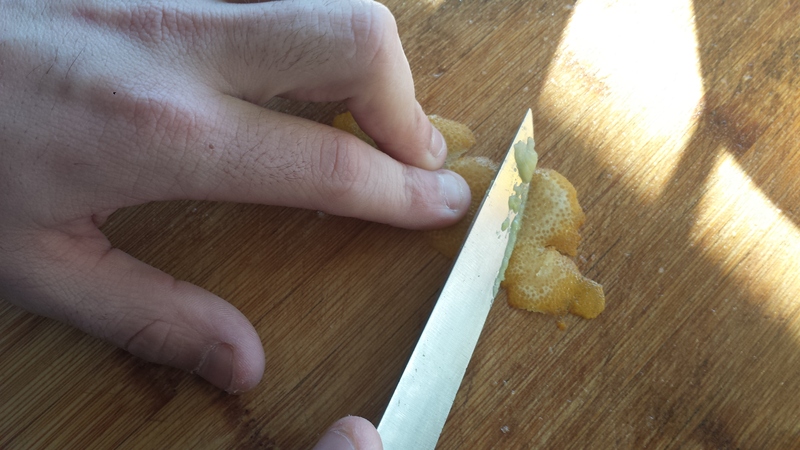 I have been told that Meyer Lemons are similar to those grown in Capri (Sorrento). My version is slightly less sweet but it is pretty delicious. Thanks!